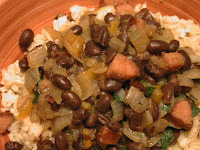 I followed the recipe as written, except I substituted black beans for kidney beans, since that's what I had in the pantry. The andouille adds just the right amount of "zing" to the dish but if you don't have any, you could substitute a different smoked sausage and up the hot pepper sauce and Cajun seasoning.While the rice was cooking, I threw together a box of Cajun Cornbread mix. Yum! Add a salad and you have a healthy and great tasting meal in no time! spoon, transfer sausage to a bowl, and keep warm.